I just recently completed the eighth round of the BCcampus Online Program Development Fund providing grants to BC public post secondary institution partnerships for development of credit-based open educational resources. A full listing of those awards can be found here on the BCcampus web site. BCcampus started supporting the development of open educational resources back in 2003 with it’s inaugural Online Program Development Fund. The 2010 call for proposals was the eighth round and brings the total investment made so far to $9 million. Given the burgeoning interest in OER I thought it might be useful to describe this years outcome in the context of an eight year retrospective that summarizes our initiative overall and presents some data on how it has evolved. Over the years I’ve been contacted by others looking to replicate our program in their jurisdiction. We helped eCampus Alberta establish their Online Course Development Fund and have recently been speaking to folks in Ontario who are interested in seeing something happen there too. The annual fund has been “one-time” money each year so far which has created challenges around launching the call for proposals on a regularly scheduled basis that is at an opportune time for faculty and staff to devote time to proposal writing. It is my hope going forward that we can get this money established as part of our operating budget so this kind of planning can take place. The amount of money available annually affects the categories and priorities the fund targets. This is an aspect of our initiative I’ve never written about before so let me take some time to describe it. The Online Program Development Fund is announced via a call for proposals that gets distributed to each of the 25 public post secondary institutions in BC. Each year when I write the call for proposals I define categories and priorities for the fund as well as the criteria that must be met. Here’s how it’s evolved over time. Learning objects are small, stand-alone units of online instruction that can be tagged with descriptors and stored in repositories for reuse in various instructional contexts. They typically are small units of learning (2-15 min at topic level) that are self-contained in such a way that it can be taken independently or grouped into a larger context. The key idea is that they are reusable in multiple contexts for multiple purposes. I’m sure everyone understands what courses are. In the context of our initiative we’ve expressly specified a preference for fully online credit-based courses. Giving preference to fully online over blended courses, that partially happen online and partially on campus, ensures we maximize accessibility to students all over BC. For the three years when the fund was $1.5 million we included a category for complete online programs meaning that proposals could request funding to develop all the online courses needed to create a complete online program. Building out a complete credential requires a significant investment so this is only possible when you have a large fund. In 2004 we introduced the categories of open source education technologies to support development of tools and apps for education and the creation of a online community providing support for online learners. We didn’t get many applications and the inclusion of a tools and technologies category complicated our open licensing approach as you cannot license software in the same way you license educational content. We discontinued these categories. The best practice dissemination category in 2005 called for proposals that aggregate and disseminate best online learning practices for students and educators and BC public post secondary e-learning research findings. This was an important category acknowledging the growing importance of complementing online learning development and delivery with educator professional development resources on how to effectively do so. To the best of my knowledge the BCcampus OER initiative is the only one that has ever funded development of professional resources for faculty and staff as OER, a practice we continued in subsequent years and a category that is very popular. We called this category professional development one year but were advised to change this name to professional learning as “professional development” was seen to be something governed by collective bargaining agreements on campus. 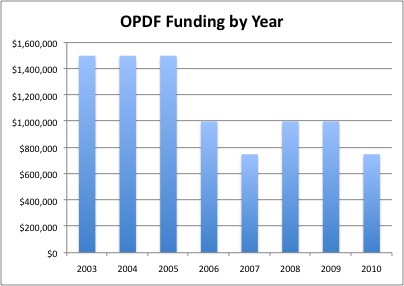 The 2010 OPDF for the first time in several years did not include this category and as a result we received fewer proposals. The reuse category of 2006 sought proposals that enhance and leverage benefits associated with existing OER based on the right to modify and improve them. Essentially we were wanting to encourage more use of existing OER and thought a category targeting this explicitly might help. We did this again in 2010 but instead of specifying it as a category we made it an overall criteria for all categories by stating in the call for proposals; “Preference will be given to proposals that integrate new online learning resources with previously funded OPDF resources, or other OER from around the world, to construct credentials.” We’re looking to see development of new resources be integrated with existing OER to create course and credential offerings. We are intentionally incentivizing reuse. The co-created content category of 2007 sought proposals to design and develop credit based online learning resources using social learning applications where faculty and students create online learning content together. We really didn’t get any proposals in this category and dropped it as an idea that may yet gain traction but currently is not a method in use for development of courseware. In 2009 we included a category for open textbooks which we saw as a new and critically important form of OER. In 2010 we lumped learning objects and open textbooks into the category course components, a simpler more plain English way of expressing what we are looking for. Specific criteria to each category are also devised to further help those writing proposals be on target. An example from the 2004 call for proposals is “Preference will be given to proposals that build out existing online programs already started but requiring additional courses to be completed.” This “preference will be given” phrasing has been key throughout our initiative in that it keeps the call for proposals open but indicates areas of specific targeted interest. Given the OPDF funding comes from the Ministry the call for proposals also includes Ministry priorities. In the 2009 call for proposals the Ministry expressed the following areas as priorities – Early Childhood Education; Health-related Programs; Programs aimed at Aboriginal Learners as well as learners with disabilities, mature learners and recent immigrants; Technician and Technologist Programs; Tourism and Hospitality. In 2010 there was a single priority – science. Evaluation, selection and award of OER grants through are done by independent professional peer review against the criteria and priorities expressed in the call for proposals. Each year I form an eight person evaluation committee made up of seven people with education technology and online learning development experience from across BC’s public post secondary system and one external evaluator. In forming an evaluation committee I try to ensure an equal number of males and females. I try to ensure regional representation of the north, the interior, Vancouver Island and the high density urban area around Vancouver known as the lower mainland. I try to ensure representation of research based universities, teaching universities, colleges and institutes. Its no small task getting the balance right! I ask evaluators to participate for a two year term and stagger their participation so that typically each year half the evaluation committee has experience with the process coming back for their second year and half the committee is new doing it for the first time. We use an evaluation process I call “progressive consensus”. The first step of this process involves independent evaluation. Each evaluator independently scores a subset of all the proposals. We avoid conflict of interest by ensuring no evaluator scores a proposal they or their institution are involved with. Representatives from the Ministry also review proposals and provide comments which are circulated to the evaluation committee to include in their independent evaluation. A couple of weeks later we bring all the evaluators together for a two day selection process. On the morning of the first day we pair the evaluators up into two person teams and ask them to reach consensus on the scores they gave for their proposals and rank order the proposals into their top 10. Once they’ve reached consensus each team of two lists their top 10 on a whiteboard for all to see. We then assemble the entire evaluation team and have each pair present their number one pick and make a recommendation. The rest of the evaluators ask questions leading to discussion and deliberation until the entire evaluation committee reaches a consensus on the decision regarding award. We then move on to the next high ranking proposal and repeat the process as a group. This process moving from independent, to paired, to entire committee evaluation is what I mean by progressive consensus. A unique aspect of our OER initiative is the emphasis on formation of partnerships. Our OER initiative is focused on funding collaborative development of curricula that benefits all the partners. Institutions form partnerships with each other based on academic program synergy and mutual academic need. Partnering involves pooling expertise and developing an online resource that all partner institutions subsequently use. While occasionally a grant is awarded to an institution working solo, 83% of the 144 grants we’ve made involve partnerships. Partnerships occur between BC post-secondary institutions and with external partners. The wider the involvement of partners in development and subsequent use, the better. Here is another chart showing what portion of the total is based on the institution having a lead role and what portion is based on them having a partner role. 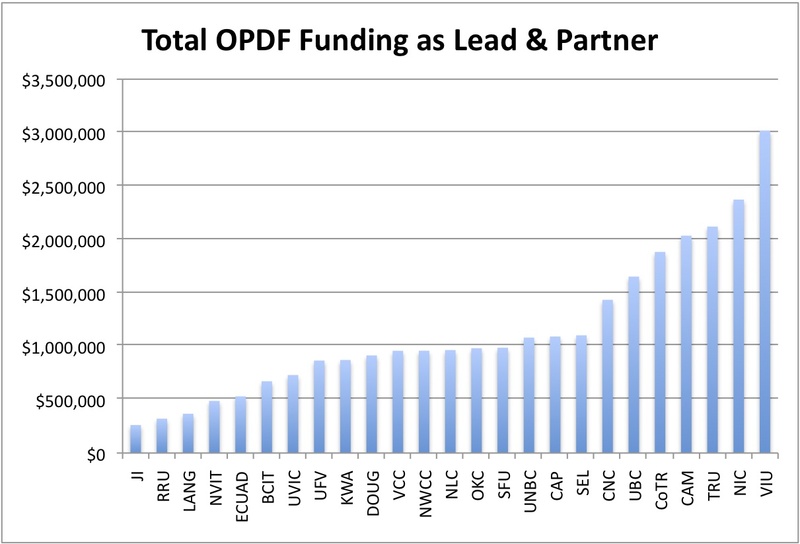 Whats fascinating about this chart is the way it reveals the benefits of partnership. 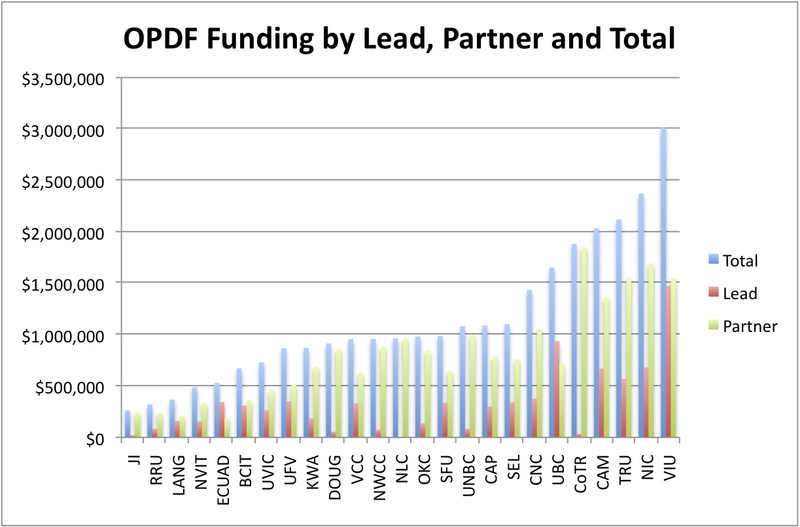 In almost every case the funding an institution has participated in as a partner exceeds the funding they have participated in as lead. College of the Rockies (CoTR), one of the smallest institutions in the province, made it into the top 5 beneficiaries of funding almost entirely through partnerships! Another way I depict partnerships is by tracking which institutions are partnering with each other. Some institutions have few partners. Others partner widely. Some OER projects are undertaken by a consortia group. For example LinkBC received a grant to develop OER related to the Vancouver 2010 Olympic Games. LinkBC is a consortia of 18 of BC’s 25 post secondary institutions working collaboratively on tourism and hospitality programs. I think of the number of partners an institution has as a measure of its collaborativeness. 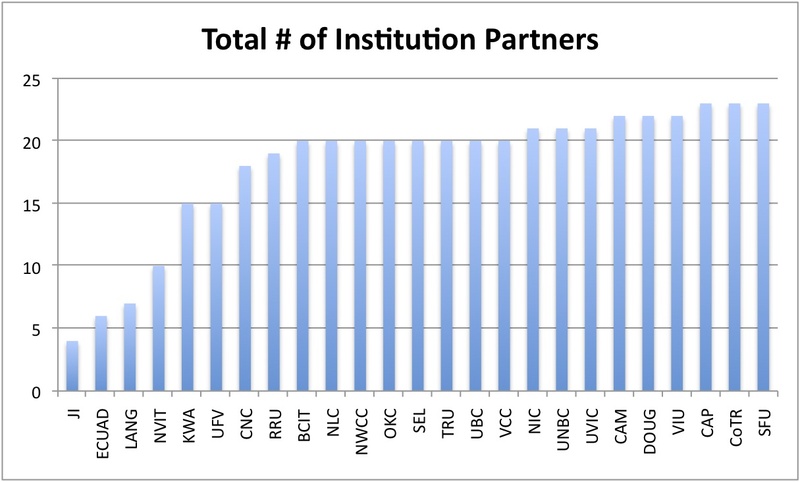 Here’s a chart depicting collaborativeness of each BC public post secondary institution based on the number of institutional partners they’ve had over the eight years of our OER initiative. As can be seen there is a lot of collaboration. Some of our OER projects involve as many as 10-15 institutions working together on development of online programs that are offered at all participating institutions. Some of the projects even involve development of what we call collaborative academic programs where the institutions share courses, teaching responsibilities, and collectively pool students. Collaboration and partnerships are one of the biggest outcomes of our OER initiative. A single round of funding allows for development of all the courses required for a complete credential. A complete credential is built out gradually through multiple rounds of funding. The OER initiative provides funding needed for development of the last few courses required to make the complete credential online. 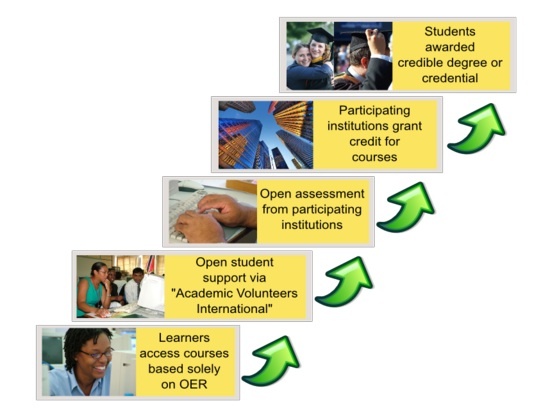 The OER initiative creates a number of online courses that can be used across multiple credentials or serve as the building blocks for creating credentials. In addition to explicit development of the above credentials some BCcampus OER initiatives develop multi-purpose undergraduate online courses or smaller course components that can be used across multiple courses and credentials. 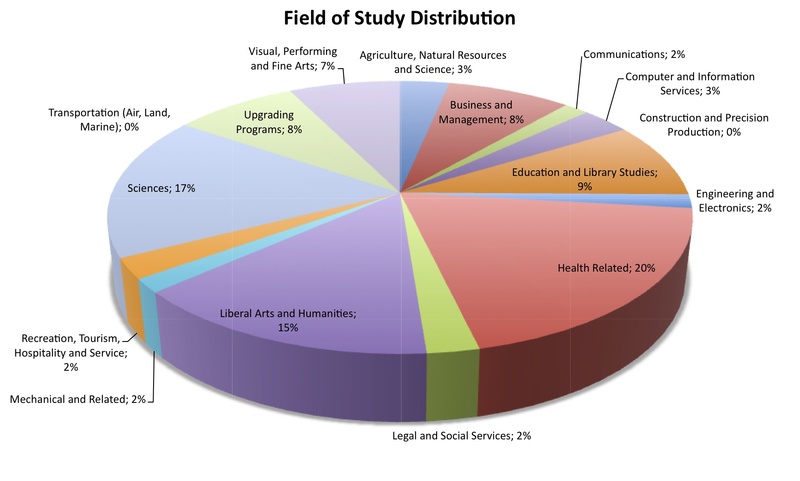 The top three areas of development, health (20%), sciences (17%), and liberal arts and humanities (15%) account for more than 50% of all awards. As an OER initiative all grants made through the BCcampus OPDF are for development of online courses and course components that are openly shared and available for reuse by others. When we first initiated this program eight years ago we decided to change the way IP and copyright were being handled when Ministry funds were provided to post secondary institutions for development of courses. Rather than the Ministry holding Intellectual Property (IP) and copyrights to the resources as was the traditional practice we changed it such that the developer (institution or faculty member) held IP and copyrights. However, we added the requirement that they agree to share. We initially started out wanting to adopt and use Creative Commons as our license for sharing OER as others like MIT’s OCW and Connexions had done back in 2003. However we met with considerable resistance from our developers who feared loss of control and competition. In the end we held on to the requirement to share but created a BC Commons license as an alternative option to Creative Commons. So starting in 2003 and continuing on to today the BCcampus OER initiative gives developers the choice of Creative Commons and BC Commons licenses. Developers wanting to participate in the global OER movement can go with Creative Commons. Alternatively they can choose the BC Commons license which provides for open sharing locally at the provincial level. I like to think of these as global sharing vs. local sharing options. Full description of our approach and the Creative Commons and BC Commons licenses we use can be found at http://www.bccommons.ca. The BCcampus OER initiative is one of the few that gives developers a choice in how they license their resources for sharing. A question I’m frequently asked is when given a choice how many people choose Creative Commons and how many choose BC Commons? 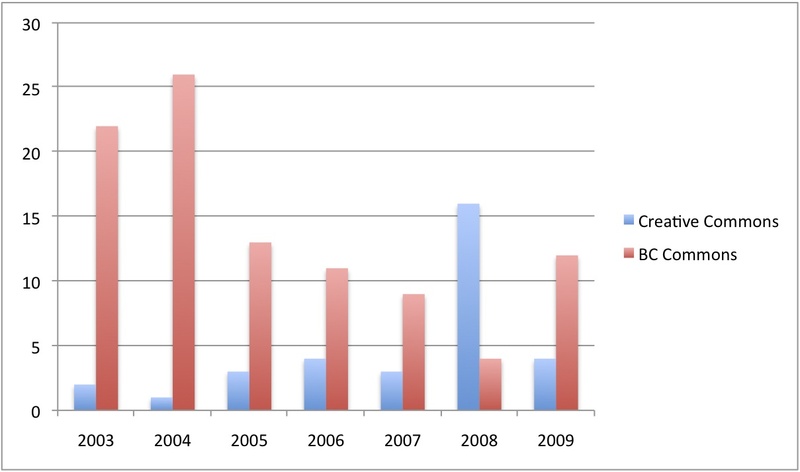 Here’s a chart showing license choices from 2003-2009. (Developers associated with the 2010 awards haven’t yet made their license choice). As can be seen from this chart the majority of developers in our OER initiative have chosen the BC Commons license vs the Creative Commons license. Overall 66% have chosen BC Commons and 34% have chosen Creative Commons. The BCcampus Online Program Development Fund emphasizes open sharing of resources. This approach is congruent with other similar initiatives around the world including OpenCourseWare, Connexions, WikiEducator and others. The Online Program Development Fund has two license options one for BC Commons, which creates shareable resources among BC’s public post secondary institutions, and one for Creative Commons, which provides a mechanism for participating in global Open Educational Resource initiatives. In 2008 Capilano College joined the global Open Educational Resource movement as the first Canadian institution to become a partner in the OpenCourseWare consortium. Higher education sharing knowledge for the benefit of all is an altruistic public service. Sharing boosts human capital through better education and skills by providing access to resources that encourage participation in higher education. Open resources accessible to all bridge the gap between informal and formal learning, and promote lifelong learning. Open resources widen access and provide supply where there is shortage. By sharing and reusing, the costs for content development can be cut, thereby making better use of available resources. Leverage taxpayers’ money by allowing free sharing and reuse of resources developed by publicly funded institutions. Eliminates the weeks and months of time it can take to seek permission to use existing digital materials. Educators can use the asset immediately without having to go through a permission seeking process. Leverages a unique aspect of digital assets – the marginal cost and effort in making copies and distributing online learning resources over a network. Quality improves over time, compared to a situation in which everyone always has to start anew. Creates a web-based, viewable, useable record of quality educational materials. Allowing others to reuse and modify original work provides a means for continuous improvement of online learning resources by a collective of professional peers. Shifts emphasis from content to teaching and learning process and services involved with using content. Creates opportunity for faculty to see, collaborate on, and reuse each others work. Provides a reputation boost to faculty whose materials are widely used. Helps students make academic plans, be better prepared, and pursue learning of personal interest. Good for public relations and functions as a showcase to attract new students. Acts as advertisement for the institution, and as a way of lowering the threshold for new students, who may be more likely to enroll – and therefore pay for tutoring and accreditation – when they have had a taste of the learning on offer through open content. Increased contact with alumni. These benefits are maximized through global Open Educational Resource initiatives that produce resources open to educators, students and the public. It looks like explicitly spelling out benefits like this encourages developers to choose Creative Commons. I’ll have to list these benefits again in future calls for proposals. BCcampus believes that the Creative Commons license choice brings with it the greatest benefits. We encourage developers who initially chose BC Commons to migrate to Creative Commons at any time. Let me illustrate some of the benefits of going Creative Commons with a couple of examples. For several years now the BCcampus OER initiative has been funding the development of a Web-based Associate of Science degree which has licensed all its development work using Creative Commons. Through three separate grants this initiative has been building out year one science courses for biology, physics, chemistry, and geology. 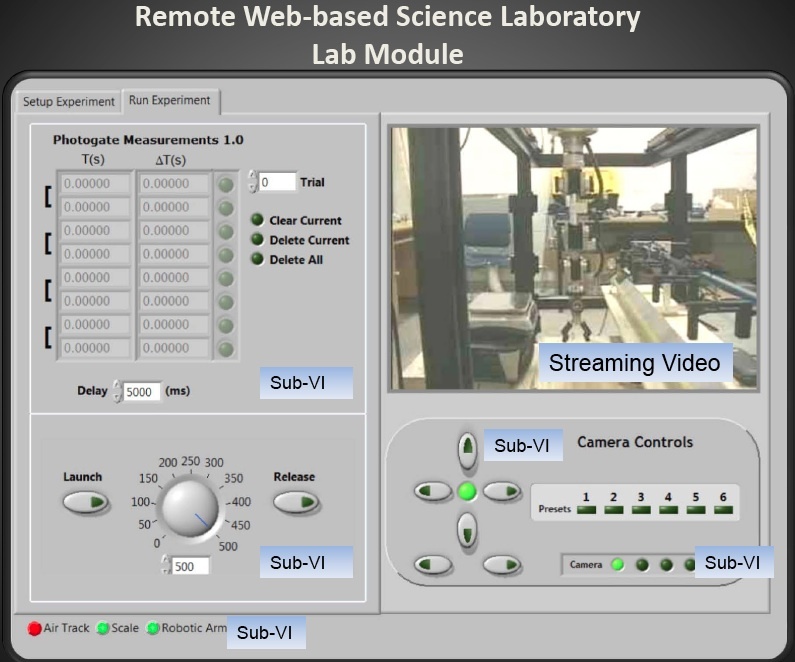 They’ve met the major challenge of supporting the labs for these courses by building a remote web-based science lab that allows students to conduct real experiments over the Internet through remote control of instrumentation. Because this work is licensed through Creative Commons it has led to the formation of a partnership with the Western Interstate Commission for Higher Education and the Colorado Community College System producing a Bill and Melinda Gates Next Generation Learning proposal for replicating and scaling up this work in the US and collaborating on the creation of a North American Network of Science Labs Online. The proposal was selected as one of 50 finalists out of 600 applications received. The Creative Commons license makes it possible to partner and grow the initiative beyond the borders of BC. Another example involves the development of three inter-related virtual soil online resources – Virtual Soil Forming Processes, Virtual Soil Identification & Classification, and Soil Parent Material and Landscape Development, all of which were licensed with Creative Commons. In July 2010 the developers sent us a summary list of Canadian and non-Canadian universities that use these resources showing use at 16 different universities and colleges across Canada, United States and Europe and use with at least 1500 students. 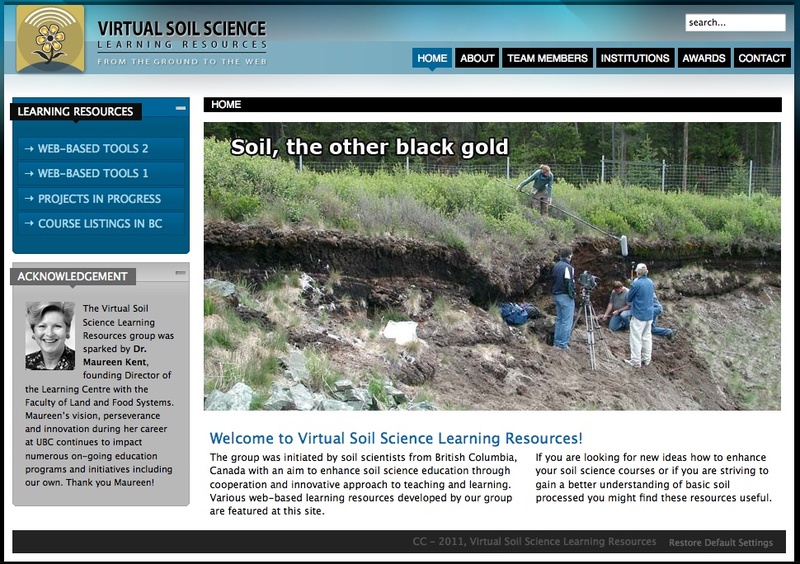 The developers of these resources just recently launched the Canadian Soil Web Collaborative. I’m really heartened by this. The BCcampus OER are all available from our Shareable Online Learning Resources repository. Thanks for joining me on this eight year retrospective of BCcampus’ OER initiative. It has been a fascinating journey and I have a feeling its only just begun. I’d like to thank all the developers who have been involved in our projects over the years. Your work is an inspiration. I’m thrilled to see BC developed OER attracting international interest and generating networks of partners collaborating on OER curricula across BC and beyond. Specify the next steps for the way forward. This is a bold move looking at what it might take to create free and open learning for tertiary education credentials using OER. 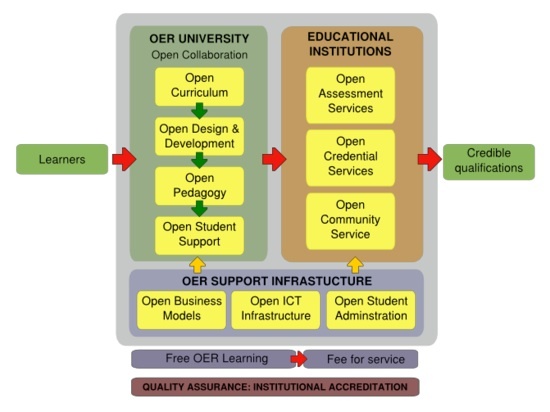 The OER university concept. Adapted from Taylor 2007. The OER university is a sustainable international system which will provide free learning to all learners with pathways to gain academic credit from formal education institutions around the world. It is rooted in the community service and outreach mission of tertiary education providers to evolve parallel delivery systems (now possible with the open web and free content licensing of learning materials) that will augment existing educational provision. The OER University is an open network and public-private partnership (PPP) including post-secondary institutions, the private sector, non-profits, government and international agencies. The OER university concept is based on the strategic enablers where it is more effective to collaborate on selected components of the OER university concept, for example shared course design and development. However, collaborating institutions retain their core operational services associated with assessment and credentialisation. This OER ecosystem aims to serve both formal and informal learners by creating more flexible pathways for diverse student needs. The design, development and implementation of a sustainable and scalable OER university concept is an ambitious international collaboration project. The logic model provides a framework for structuring and organising the range of activities, processes and constituent components necessary to achieve the desired results. Individuals are free to learn from OER hosted on the open web. The problem is that learners who access digital OERs on the web and acquire knowledge and skills either formally or informally, alone or in groups, cannot readily have their learning assessed and subsequently receive appropriate academic recognition for their efforts. The core mission of any modern university is to contribute to society as a community of scholars through the pursuit of education, learning and research. Many post-secondary institutions also incorporate the mission of community service, as publicly funded institutions, to serve the wider interests of the communities in which they operate by sharing expertise and scholarship for the benefit of society. By combining OER with the community service mission, it is possible to create what Taylor has called a “parallel universe” of higher education delivery to complement and augment existing provision, especially for those who lack the means to follow traditional learning paths. Moreover, the OER university concept is a means whereby education at all levels can be more accessible, more affordable and more efficient by reinvesting savings of shared course development back into the formal teaching operations. As part of my work at BCcampus I’ve been facilitating an OERU online seminar in our SCoPE online community in advance of today’s OERU meeting in New Zealand. This SCoPE seminar has been planned to stimulate discussion in advance of todays meeting and to provide a forum for follow-on discussion after today’s meeting. I promised meeting organizers I’d provide a short summary of our discussions and drop-in think tank web conference as an input into today’s face to face meeting. The following notes are summarized from SCoPE OERu online discussions and an OERu drop-in think tank web conference session held over the period 4-21-Feb-2011. The summary has been distilled from contributions made by participants from Israel, United States, New Zealand, India, Canada, Netherlands, Australia, United Kingdom, Pakistan, Portugal, and Brazil. is a a consortium of partner universities – a university of universities. Participating colleges/universities are given an OERu logo to post on their web-sites designating them as participants. brings together currently separate OER initiatives to generate collaboration between them for development and assemblage of OER into mutually credentialed outcomes. creates a framework within which existing OER can be assembled and new OER development positioned. provides student support resources to help students navigate their learning paths and compile portfolios. Partners with institutions who provide options for student support possibly on a fee for service basis. A 24×7 call center for assisting students. creates a social learning context for OER reinserting or applying pedagogy to OER. Utilizes mass collaboration approaches combined with social networking to establish peer-to-peer and tutor-student support potentially with senior students receiving credit for tutoring juniour students. Provides a brokering/marketplace where those who want to facilitate learning can meet those who want to learn. Emphasizes peer-to-peer social learning over teacher/student traditional learning. Students as teachers solidifies learning. provides continuous entry points throughout the year with entry by exams rather than prerequisite courses or degrees. A 365 days online registration and evaluation process. How to develop the course materials for learners globally? Providing not only free education but free authentic, valid and reliable certification too. Leaners may need to pay for credential services unless national governments provide grants to cover these costs through the state education system. Finding a free online platform or specifying that learning materials for the OER university be developed (or converted) into open file formats that are equally accessible by a variety of Learning Management Systems (LMSs). OER have to be available or at least readily convertible to low tech, pencil and paper, or print-based materials. Institutions will not move toward an OERu strategy unless they see a clear benefit for themselves. Does OERu need to be a parallel higher education universe? Develop low-overhead quality and accreditation systems building an entirely new model rather than adapting the old one. The concept of an OER-university is an innovation and a major one for the education globally. Individual and organisational adoption will depend on the current concerns and benefits of this innovation for them. Be more creative. Start without thinking about existing systems and courses. Rethink units of learning. OERu needs to be younger and bolder. We need to get our heads into being 15 to 25 again. We already have a critical mass to at least get one degree operational. This summary is available for the New Zealand participants and anyone else as a .pdf download in the OERU Meeting Agenda. Its always a challenge to distill and coalesce rich online discussions but I think this summary is a great start to defining an OERU. I’ll be briefing the New Zealand participants on our activities and this summary via phone later today. Hope many of you will contribute to the concept of an OERU and look forward to seeing what emerges.